"I'm going to live to be 144 years old." In Japan, used-car auctions are a booming business. We visit the busiest auctioneers in their sprawling new Yokohama venue to find out why. 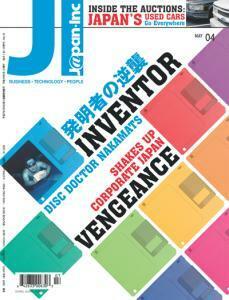 Wacky Doctor NakaMats (Yoshiro Nakamatsu), inventor of the 3.5-inch floppy disk, and the battle for remuneration from corporate Japan. An improving economy means intense recruitment pressure. Consensus-seeking, conflict-avoiding, corporate Japan is getting a jolt this year in the form of a mini-rebellion. Tech Talk: The latest tech. A historic village is a microcosm for northern woes. David McCaughan and McCann Pulse tell it like it is. "Go West, young man," say two Tokyo-based media brothers. Our analyst tackles the terrorism tax and tips on Japan. Kansai's very own whisky rebellion.